Behind Alaska’s giant engineering feats such as GCI’s TERRA network are stories of the people who made it happen. One name for the history books is Rebecca Markley, GCI’s project manager for Terrestrial for Every Rural Region in Alaska from the first foot to the last leg. Markley choreographed the logistics for all 3,300 miles of it: leasing land, permitting and setting up transportation for crews. She tracked each cell tower site from construction to final set up. People she worked with say Markley’s got one of the best TERRA maps kept in her personal mental archives. When Markley joined GCI’s customer service department, she had no clue her work for GCI would have such far-reaching impact. 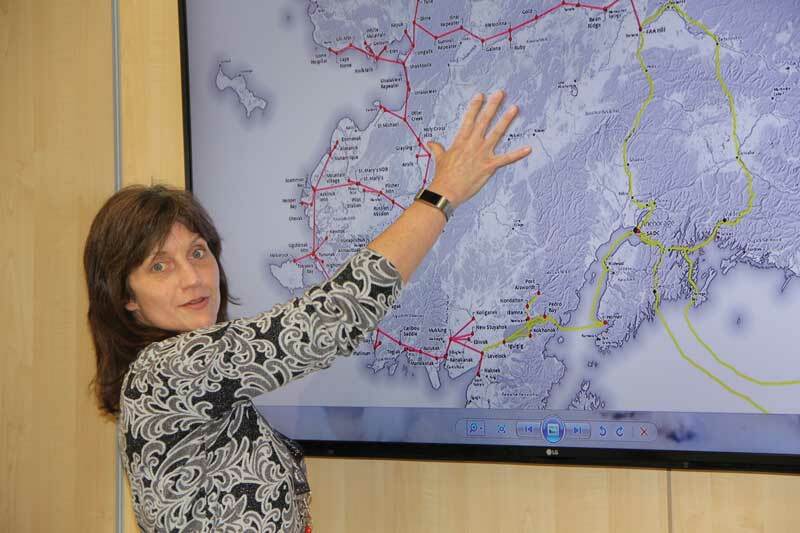 Laying the groundwork to connect remote Alaska to the rest of the world via high-speed internet became critical for saving lives, opening economic opportunities and improving education. For starters, picture TERRA’s communication system as a ring starting in Homer and extending west to Bethel and Dillingham, north to Unalakleet then Nome and Kotzebue and back down to Nenana, Anchorage and the Kenai Peninsula. It includes buried fiber optic cable, laid in the early phases of the project across Cook Inlet, plus an extensive network of 120 microwave antennas mounted atop 30 towers as high as 305 feet tall. “It’s probably one of the biggest, if not the biggest, long-haul, contiguous microwave systems in the world,” said GCI project engineer Patrick Goodyear. The entire TERRA project includes 95 towers and 108 sites, 24 of which are on mountaintops. The average shot — the distance that the microwaves need to travel between antennas — is 35 miles, with the longest at 83 miles. Now completed, the system supplies communications for 84 villages. In February 2002, Markley landed in frosty Anchorage with her husband and three children ages five to 12. Clarence Markley is in computer operations and maintenance in the U.S. Air Force. Their tour of duty sent them to Germany and Japan before the Alaska assignment where Clarence wanted to retire. After years of being a stay-at-home mom, Markley sought full time employment. Markley took the customer service position. After a couple of years as a supervisor over field technicians, a project management position opened in 2006. “At that time, it meant working mostly on rural projects; no one else wanted to do it,” she said. Prior to TERRA’s construction, GCI supplied managed broadband to bush schools and health corporations. In 2006, Markley worked on projects focused on customer, schools and health corporation upgrades. “In that position I soon learned where every village was in rural Alaska,” Markley said. As a project manager, she set up logistics, housing and transportation for technicians who came out to work on the ground-based broadband. “I personally would deal a lot with the cities, villages and local people who could get us lodging, four-wheelers, transportation from the airport. I interacted with locals to schedule upgrades with schools and health corporations. It was a good background for what was ahead,” she said. In the meantime, GCI was conceiving a better network to supply rural Alaska: a new, 3-gigabyte microwave and fiber network that would form TERRA was in the design stages. By the time stimulus funding became available through the American Recovery and Reinvestment Act in 2009 under the Obama administration, “we had a shovel ready project to the deliver the services,” says Heather Handyside, GCI’s senior director of communications. To fund the $300 million project, GCI gained $50 million in federal funding and brought in $250 million of its own capital to build out the system. It would be completed in four phases, starting in southwestern Alaska in the Illiamna Lake area, two more phases in the northwestern Alaska and a fourth Yukon phase. By the time GCI posted the open position for TERRA’s project manager in 2010, Markley had completed a master of business administration in telecommunications at Alaska Pacific University. She took classes at night after working days at GCI. “On weekends I cooked large meals my family could eat during the week,” she said. The MBA may have helped in selecting her to lead the project. In 2010, the project began, with the first build completed in 2012 that connected 65 villages in southwest Alaska. “When a vice president retired, they felt like I should jump in the saddle and run with it. I didn’t know a lot about environmental permitting and leasing or hiring contractors to build shelters, or about the civil engineering on several installations. It was quite a bit to handle,” Markley recalled. She learned quickly. At a few points, the project was delayed during the short window of summer construction. One was the Yukon River caribou herd during environmental permitting. GCI needed to do mitigation to make sure their construction wouldn’t negatively impact the herd. To do that, GCI paid for flights for the Alaska Department of Fish and Game to study the caribou herd during calving season, Markley said. In another setback, a contract crew for GCI, Kikiktagruk Inupiat Corp, stumbled on an archeological find that stopped their TERRA track and called for a two-year halt. But 4,000 objects estimated at 800 years old came of the discoveries and GCI volunteered to pay for curating the collection. 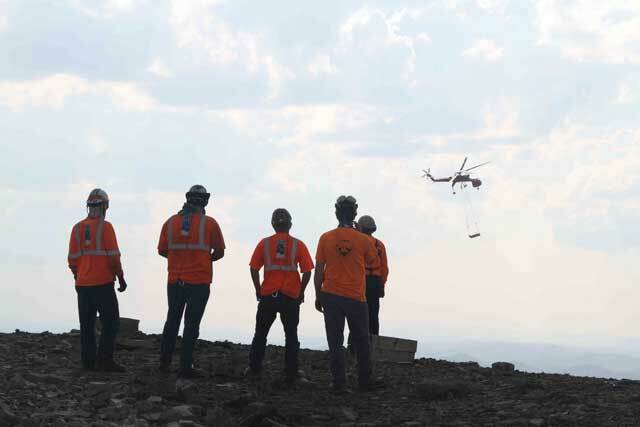 Markley said a typical day for the most part included orchestrating remote fueling operations, observing strict permitting guidelines, arranging helicopter lifts, supplying mountain-top camps, shipping heavy equipment and tons of steel. The smaller helicopters got personnel on and off sites. It took a heavy-lift Erickson Sky Crane helicopter to haul up to 20,000 pounds per flight to build the tower sites. As the director of rural initiatives, her most recent title at GCI, Markley “anchored” the telecom company’s TERRA project group. This meant she supervised other managers for oversight over the entire project. She also traveled with the crews to whatever rough location the work took them. Although TERRA’s four phases are completed, that doesn’t mean there’s not a lot more to do. “Finishing TERRA is a milestone, and the ‘parade’ celebration was all about closing the ring, but we’re not done yet. Alaska is a huge place. There are always more villages to connect, more bandwidth to add,” Markley said. Since the “ring” was closed in the final TERRA phase this past December, the system has redundancy and if there are breakdowns at any point, backups kick in to keep internet power continuous. The buildout will focus now extending from the “spurs,” or backbone villages where new connections can be built out to the closest settlements. A “donut hole” left in the middle of the state west of Kotzebue and east of Fort Yukon present challenges. “We’re able to get the villages closest to the backbone. Any other villages after that can require a lot more repeaters. They will be more difficult for us to reach,” Markley said. Meanwhile, the TERRA map shows an untouched Aleutian Chain. “In the Aleutians we’re looking at fiber instead of microwave. It’s a little easier. Microwaves reflecting off water doesn’t do so well,” she said. Now it’s Markley’s job to help figure out what’s next: what’s possible and how to get there. Her eyes rest on the TERRA map, this one on her laptop in front of her, at the end of the interview. “It does feel good to have this accomplished,” she said.